The image 3 helps patients stand up early by the support of SafeFree®-side rails and the unique 3-Stop strategy. An extra-low patient positioning (patient surface height 28 cm) reduces the risk of injuries in case of a fall out of the bed, especially during the night. SafeFree®- telescopic full length side rails provide an outstanding solution for a wide range of patients. Different height settings allow the adaption of the side rails to the individual patient's needs for protection. 3D bumpers protect the bed from both horizontal and vertical damage. The linen holder makes the daily routine easier. Foldable retainers allow adjustment for different mattress widths. The image 3 electrically adjustable bed respects the growing demands of patients and nursing staff. Its attractive design will find universal use in a whole spectrum of hospital care. 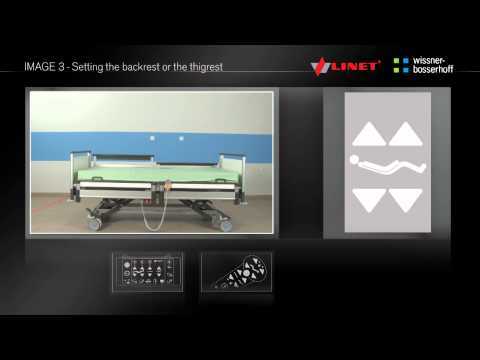 The image 3 deals with patient safety and mobilization in a unique way: combining split telescopic side rails and a reduced, low height. The special design of the SafeFree®-side rails provides support and helps the patients mobilize themselves. Different height settings allow the adaption of side rails to the individual patient's needs for protection and the design without middle posts or central gap protector allow unrestricted access to the patient. The special design of the SafeFree®-side rails provides support and helps the patients mobilize themselves. An optimal adjustment to the individual mobilization height for different patient sizes is possible thanks to the flexible height settings. Ideal construction for machine cleaning in accordance with AK-BWA. Sustainable fall prevention for utmost safety. This is what the SafeSense® bed exit assistance system of wissner-bosserhoff stands for. It can considerably increase the level of safety, especially during night and weekend shifts with fewer staff. The space in the pelvic area is extended by 16 cm in total in order to remarkably reduce shearing and friction forces when the bed is positioned. In addition, the new member of the image 3 series convinces through a homely hotel design, which provides the ambiance of a healing environment through its universal usability, not just in rooms with additional services. Special scissor construction provides reduced height of just 28 cm above floor level when 125 mm castors are used.